Our wavy edge hook & loop discs will allow you to sand in a wide configuration of convex shapes. They are ideal for bowl turners and general wood turning. The wavy edge extends out beyond the edge of the backup pad so you can flex the disc into contours. We offer both 2" and 3" discs in a wide selection of grits and back up pad flexes. These are cloth backed discs not the common paper discs. They will greatly outlast the paper discs. If you are new to the product try one of these starter kits and you will see how useful they can be. The discs in the shopping cart are aluminum oxide. We can also supply silicon carbide wavy edge discs for sanding stone like materials including sculptures. Contact us for info on these silcon carbide discs. 10 each cloth wavy edge discs in 80, 100, 150, 180, 220, & 320 grit. Backup pad with 1/4" shank and three solid interface pads. Download a printable copy of this page. 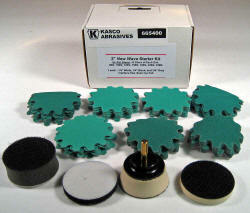 We also offer 5" and 6" Interface Pads pads on this page.